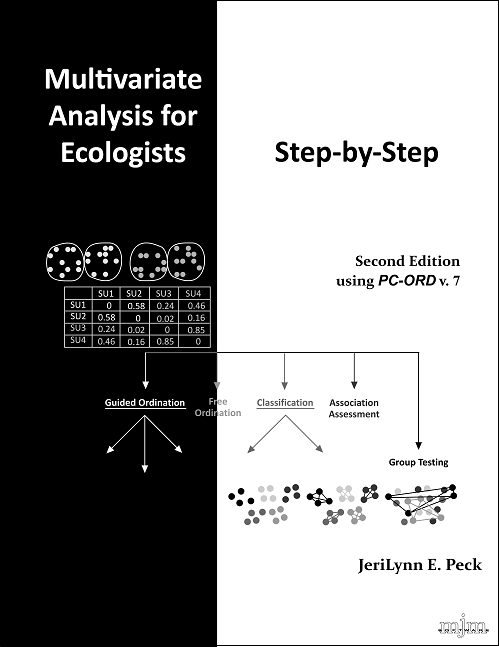 Multivariate Analysis for Ecologists: Step-by-Step is a book by Dr. JeriLynn E Peck that answers your questions: What are multivariate data? How should I prepare my data? Which analysis tools should I use? What do they do? Do they have weaknesses? How do I interpret the output? Cover graphic: The analysis of community data is a process involving many steps, an example of only a few of which are portrayed here from top left to bottom right. Samples: The multivariate community data analysis pathway begins with field observations from different samples. Matrix: Based on these observations, a square distance matrix is computed to assess the dissimilarity of sample units to one another. Flowchart: A decision is made to select the most appropriate analysis tool to address the stated analysis objective: in this case, the group-testing tool MRPP. Analysis: MRPP calculates within-group distances for comparison to random assignments to groups. This book is the required companion book for the workshops/webinars I teach on this subject, used in lieu of a handout. The structure thus parallels the ten step analysis process I propose. Step 1 is intended to get you ready to conduct the analysisrefreshing your statistical background and clarifying your analysis objectives. Step 2 is getting your dataset ready for analysis using the PC-ORD software. Step 3 is to structure your matrices to address your analysis objectives. Step 4 focuses on exploring your dataset to make sure you understand its properties, while Step 5 is about selecting the analysis tools that will best achieve your objectives. Step 6 involves manipulating the dataset, when needed, to meet those objectives and fit those tools. Each chapter in Step 7 focuses on a different analysis tool, allowing you to direct your attention to only those you wish to apply. For each procedure, I provide a conceptual description of what you can do with it and when you might use it, what it actually does, what the results mean, how to run it, what you get in the output, what you should know about its strengths and weaknesses, how to run it in PC-ORD version 7, and then a little on how to interpret it. There are certainly more ways to use the tools discussed in the book than the few presented here, but I hope the descriptions provided will at least get you thinking about the application of these tools. Finally, Step 8 briefly reinforces the need to seek confirmation of your results before turning to interpretative tools in Step 9 and communication in Step 10. Supplemental information, including instructional materials, is provided in the Appendices and online.